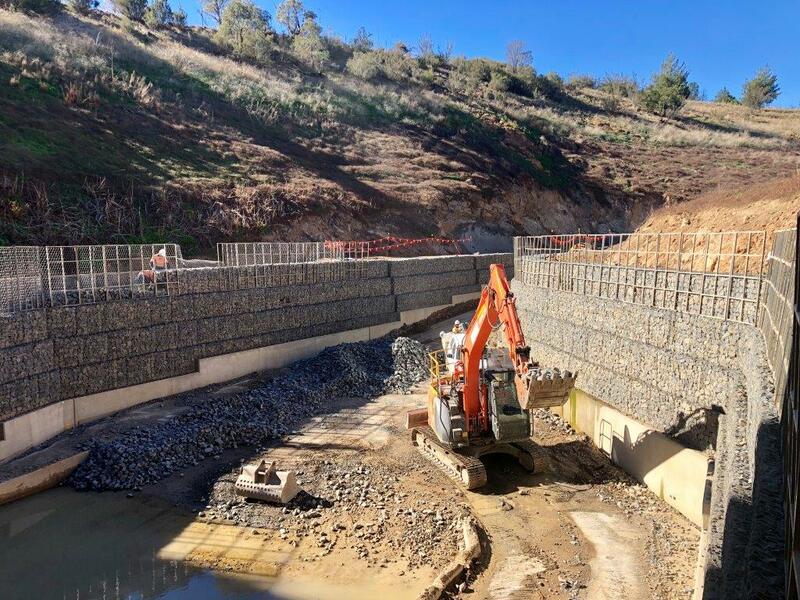 Commencing in October 2017, The Lower Molonglo Water Quality Control Centre (LMWQCC) Dam Stabilisation project involved remedial works and preventative maintenance on crucial and active elements of the largest inland sewerage treatment plant in Australia. Key works were carried out within the LMWQCC’s Bypass Storage Dam which acts as a last resort buffer storage for the plant of 147 ML. The purpose of the dam is to capture partially treated sewage to prevent any release into the Molonglo River. Stantec Australia contacted Geofabrics to aid in selecting a suitable retaining structure solution for the infeed channel. Geofabrics conducted preliminary stability analyses using the Maccaferri MacStars software and provided typical details for the proposed reinforced soil wall configuration. 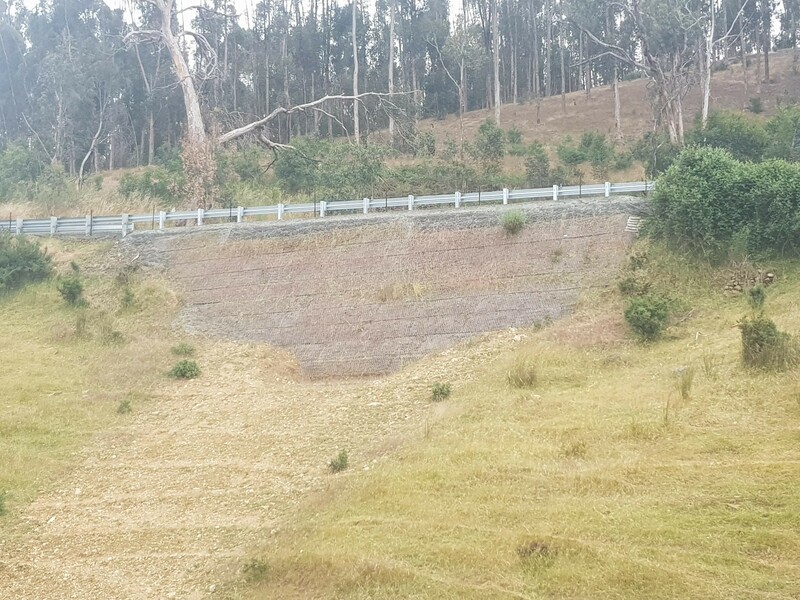 The detailed scope of works included construction of 1350 m³ of Maccaferri Terramesh walls founded on 1.2 m wide concrete footings and rock anchors to tie into existing embankments. The Terramesh system was selected due to the reduced rock quantity required, 100% positive connection between soil reinforcement and facing, speed of installation and the relatively narrow width due to the ability of connecting the soil reinforcement to the existing rock slope. Maccaferri Terramesh is supplied as pre-assembled units of double twisted wire mesh. The facing section of the unit is formed by connecting a back panel and diaphragms to the main fascia unit, thus creating the rectangular shaped cells used for stone confinement. The soil reinforcement, fascia and lid are all one continuous panel of mesh. Geofabrics provided comprehensive design assistance to the designers which included wall stability analysis using the Maccaferri Macstars software, typical drawings & details and specifications. The Terramesh structures were installed by specialist installers, Prospect Contractors, as per the comprehensive Maccaferri installation guidelines. Geofabrics also supplied gabions, bidim geotextile and “C” rings. The structures have been installed to a very high standard and have received several commendations. At the completion of the project, stabilisation of the dam provides a safer access environment within the dam, reduces the current dam maintenance regime and prevents potential damage to existing plant infrastructure. The project was successfully carried out within an active sewerage treatment plant without disrupting operation of the plant.